The Regional Consultation in Eastern Europe and Central Asia. The countries included in this region are: Albania, Armenia, Azerbaijan, Belarus, Bosnia and Herzegovina, Croatia, Georgia, Kazakhstan, Kyrgyzstan, Macedonia, Moldova, Mongolia, Montenegro, Russian Federation, Serbia, Tajikistan, Turkey, Turkmenistan, Ukraine, Uzbekistan. of the consultation would be Russian and one in Belgrade (Serbia) where the language of the consultation would be English. The Regional Lead Organisations initially met in Vienna in March 2007 at a briefing and planning session for the RLOs from the six regions being financially supported through the project. It was at this meeting that they agreed on the two sub-regional consultations and the provisional dates for the meetings in Kiev and Belgrade. 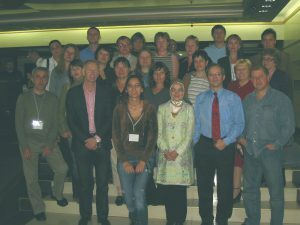 Kiev was the first sub-regional consultation and was held from the 12 – 14 September, 2007 in the Hotel Bratislava, Kiev. To identify possible participants an application form was developed by the RLOs. This was widely distributed using the networks of the RLOs as well as lists of organisations provided by UNODC HQ and its country offices. It was a lively and thoughtful event with representatives from across the region and organizations with a wide range of approaches taking part. The report from this sub-regional consultation has now been prepared and can be downloaded in Russian or in English. It will be combined with the report from the Belgrade meeting to form a single report for the region in due course. As in Kiev, discussion was full and explored the specific questions presented at the consultation in great detail. It rapidly became clear that there were considerable differences between the experiences of the East European and Central Asia NGOs who met in Kiev and the Southeast Europe NGOs who met in Belgrade. Nevertheless, there were also areas in common, especially in relation to the limited or non-engagement of NGOs in developing policy and strategy as partners with government, although NGOs were a major provider of interventions. It was also clear that significant areas of work were dependent upon the provision of resources from international organisations and that there were serious problems for long term sustainability of work to tackle drug and drug related problems. The report from this consultation is now being prepared and will be published on this web site when available. In the meantime, you can view photographs from both sub-regional consultations by clicking on this link.